Google Scholar is not just for finding academic texts but they also work with biblimetrics. In July they released 2013 version of high ranked journals. Articles published between 2008 and 2012 and that are on websites which follow Google Scholar’s guidelines for inclusion are included. Journals with less than 100 published articles during the years in question and articles with no citations are not included. There is of course problems with Google Scholar’s way to measure ciations as does everyone when it comes to bibliometrics. A growing problem is that there are companies who sell impact factors to and that self-citations can be used to manipulate h-index and some journals reward those who cite articles published in the journal in quesion. This is not so important for what I propose you use the list for. The list, in spite of some problems, a good place to start when scouting for journals to publish in. If you find one of interest, you should look into it by visiting the journals web pages, check some of the previously published journals, look for it in Ulrichs etc. The journals are divided in to eight groups with subgategories. A h-index and h-median are shown. Read in Wikipedia about benefits and critisim of h-index. Here below you can see the subgategory of Engineering & Computer Science. Also, notice that there are possibilities to check which journals are central in other langugages than English. 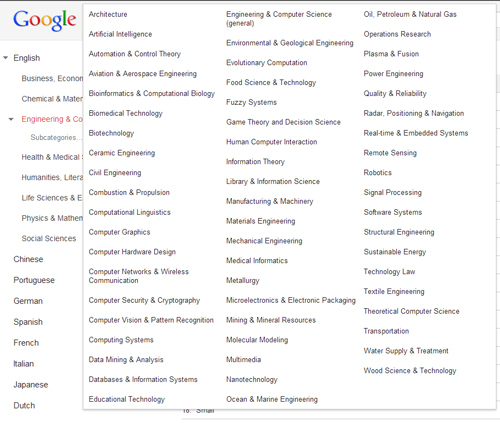 Browse among journals in Google Scholar metrics 2013. Contact me when you need advice on choosing a journal to publish in. This entry was posted in Bibliometrics, Publish and tagged choose a journal, Google Scholar metrics by Forskningsrelaterat. Bookmark the permalink.